The new Jeep Compass SW Diesel is a massive improvement on its odd-looking predecessor. Its strengths lie in its off-road ability, where it stands head and shoulders above the competition. It’s also comfortable and stylish and works well as an affordable all-rounder. It’s not the most entertaining crossover on the road, but with good levels of practicality, it should appeal to the average family. Jeep is famous globally for off-road ability and the company has a rich history which goes back to World War 2. If you are curious and would like to find out more about this off-road brand we have an article detailing the company’s history from the 1940s to the present day. 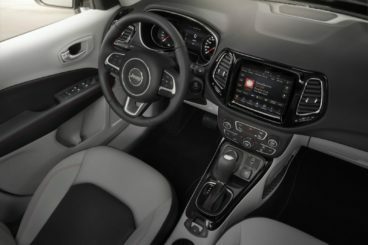 OSV takes a closer look at what it’s all about with our 2018 Jeep Compass SW Diesel review. There’s a noticeable lack of finesse here, and the Compass isn’t as well planted as its rivals. That said, it’s competent and does a job. However, body roll is excessive in bends and the chassis doesn’t cope well at high speeds. It feels unsettled, and this is a real flaw as many cars in this sector are able to cope much better at speed. On the other hand, the Compass is one of the best off-roaders in this class, if not the best off-roader. Especially if you opt for the range-topping TrailHawk version, you’ll have a car you can trust to take good care of you in rougher terrain. The ride is also decently composed and the steering is reasonably well weighted. However, the Compass loses out to rivals in the fun stakes and its diesel engines are on the noisy side. Speaking of those engines, a 1.6-litre MultiJet II diesel unit kicks things off. It develops 118bhp and 320Nm of torque and comes with two-wheel-drive as standard. 0-62 is dispensed within 10.7 seconds. Next up is a 2.0-litre MultiJet II diesel engine that produces 138bhp, and which is four-wheel-drive as standard. Buyers can choose between a manual and an automatic ‘box, and if you choose the former you can complete the 0-62 dash in 10.1 seconds. Specify the automatic transmission, and 0-62 can be dusted off in 10.5 seconds. Rounding off the range is a 168bhp variant of the same engine. This is an automatic and four-wheel-drive only power plant that has a 0-62 time of 10.1 seconds. Not the fastest then, and as mentioned all the diesel engines are loud. Jeep have certainly improved the car’s exterior and it’s a lot more stylish than last time. However, they haven’t spent quite as much time on the interior and the cabin feels and looks like a bit of an afterthought. It’s a bland, lifeless affair that’s perked up by the use of soft-touch plastics here and there. We don’t have too much of a problem with the quality of the materials – the chunky steering wheel, in particular, looks great – but a bit of colour wouldn’t have gone amiss. As it is, there’s a lot of blacks and greys in here that create a sombre atmosphere. Moreover, only the range-topping model gets the biggest and best infotainment system. This comes with an 8.4″ touchscreen that’s easy to use and compatible with Android Auto and Apple CarPlay. The entry-level models, meanwhile, come with a smaller 7″ screen that functions well. Insulation isn’t the best if you do decide to go with a Diesel engine, while reactive dampers are optional and improve ride comfort. 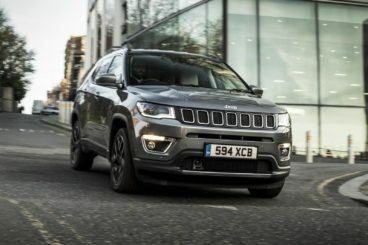 Is the Jeep Compass SW Diesel practical? It’s essentially no bigger than your average five-door hatchback but it’s got the practicality of an estate car. It’s bigger than the Renegade and there’s plenty of room up front for the driver and their passenger. The steering wheel and driver’s seat offer lots of adjustability and visibility is good. Rear leg and headroom is also good, as is shoulder room. A reduced glass area makes things darker than they need to be back there but that’s really a minor complaint. The boot meanwhile, measures 438-litres which makes it about average for this class. A flat loading floor will prove handy. So, how reliable is a Jeep? We’ve put together an unbiased report with all the information you could need. Standard kit is decent across the range, with the entry-level model getting 16″ alloys, air conditioning, cruise control and LED rear lights. The Longitude model comes with front fog lights, keyless entry, dual zone climate control, sat nav, a reverse camera and 17″ alloys. The Luxury model adds the bigger 8.4″ touchscreen, as well as 18″ alloys, a heated steering wheel, leather seats, front and rear parking sensors and automatic wipers. Rounding off the range is the TrailHawk model that comes with a tow hook, a Rock low-ratio model for the automatic gearbox and tougher suspension. In terms of safety, the Compass SW enjoys a 5-star safety rating given to it by Euro NCAP. Its standard safety kit includes a forward collision warning system and lane departure, and altogether there are as many as 70 safety systems onboard, although some of these are optional. Prices for the new car start at £24,995 and rise to £32,595. For more information on our leasing deals, you can check out our page here. In terms of its running costs, the 1.6-litre 118bhp diesel is the most frugal in the range. It can return 64.2mpg at best and emits just 117g/km of CO2. The bigger 2.0-litre 138bhp diesel engine, meanwhile, is good for returns of 54mpg and emits 128g/km. Rounding off the range is a 168bhp four-wheel-drive variant of the same engine, and it averages just under 50mpg. Emissions are pegged at 148g/km. If you need a mid-size crossover that’s good off-road, you don’t need to look any further. Jeep have really modernised the Compass and it looks better than ever. It enjoys a 5-star safety rating and has plenty of onboard safety tech – as many as 70, in fact! It’s not as composed, smooth or fun as rivals. At lower revs, the diesels are loud. Let’s see how the car fares against its rivals in the comparison section of our 2018 Jeep Compass SW Diesel review. The new SEAT Ateca is a sizeable car that has plenty of road presence. 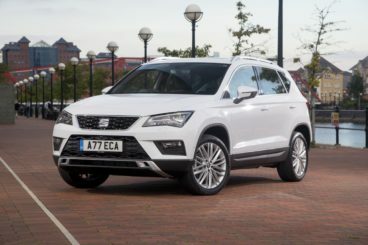 SEAT have developed a reputation for producing cars that are great to drive and the Ateca is no different. It might be hefty, but precise, light steering means you can take corners without losing your nerve. The ride is a tad firm but not so much so as to become a problem, and body lean isn’t as much of an issue as it once was. A switch on the centre console, meanwhile, allows you to tweak its steering, transmission and accelerator pedal so that the car’s character suits your mood or the conditions. In terms of its engines, a 1.6-litre diesel sits at the bottom of the range. It has a 0-62 time of 11.5 seconds, and while that sounds a bit slow, this is actually a very competent engine that we highly recommend. A bigger 2.0-litre diesel is available with either 148 or 178bhp. The latter is super quick and can get you from rest to 62mph in just 7.5 seconds. Running costs? The 1.6-litre diesel can return as much as 61.4mpg on a good day and emits 120g/km of CO2. This gives it a BiK rating of 29%. The 2.0-litre 148bhp diesel can return as much as 55mpg if you stick to the cheapest trim, while the 178bhp diesel is good for 53mpg when paired up with four-wheel-drive. Inside, the Ateca is handsomely designed and laid out, and it’s a cabin that the family can sit comfortably in. Everything is easy to use and the dials are simple enough to read. The overall quality of the materials could be better but build quality is good and there won’t be too many complaints. Is the SEAT Ateca practical? Visibility is excellent front and back, the wide opening doors make access easy and the driver’s seat offers lots of adjustability. Best of all, five – as opposed to four – adults can sit in comfort, with even rear seated passengers enjoying good leg and headroom. The boot meanwhile, measures 510-litres, which is very generous. That said, if you opt for the four-wheel-drive variant, the boot shrinks to 485-litres. The new Volkswagen Tiguan is another excellent family car from Volkswagen that’s quiet, roomy and looks great. It’s not all that dynamic to drive, but if you want a car that’s smooth and hushed on the move, it ticks a lot of boxes. It also comes with Dynamic Chassis Control as an optional extra. This feature lets you tweak the suspension setup so that it’s either softer or firmer. The car is composed at speed, its steering offers lots of feedback and insulation is good. In terms of its engines, there are four variants of a 2.0-litre diesel engine. The smallest of the four develops just 113bhp and will be overlooked by most buyers, but a 148bhp variant is our top pick. It suits this car well and copes with its weight with ease. A bigger 187bhp variant adds more power but the way it delivers its power is a bit uneven. Four-wheel-drive is standard. An even bigger twin-turbo 237bhp variant rounds things off. It can propel you from a standstill to 62mph in a matter of 6.5 seconds and comes with four-wheel drive as standard. Running costs? Stick to two-wheel-drive and the 148bhp diesel can return as much as 60.1mpg economy on a good day while emissions are pegged at 123g/km of CO2</sub.. That makes it just as economical as the smaller 113bhp variant. Opt for four-wheel-drive and you’ll average 53.3mpg. The bigger two diesels, meanwhile, can return as much as 49.6 and 44.1mpg economy. Inside, the Tiguan has a real modern look and feel to it. In fact, it looks a lot like the new Passat – no bad thing, of course. The problem is that the dashboard has no pizzazz. Still, there’s no arguing with the amount of quality on display here. While there are harder plastics further down, there are also lots of high-quality plastics on show and the layout of the dashboard is very slick. 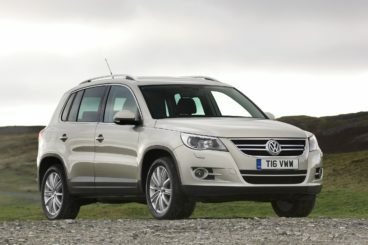 Is the Volkswagen Tiguan practical? It’s bigger than its predecessor and can boast more room. Rear seat passengers should be happy enough with the amount of head and legroom on offer, and the rear seats can be slid backwards and forwards for extra space. Storage solutions are good and include some sizeable door pockets, while the boot measures a massive 615-litres if you push the rear seats forward. It comes with a variable height floor and can be extended to 1,655-litres by folding the rear seats. Jeep have improved this car hugely so that it’s now a competitive and stylish off-roader that’s affordable and practical. It’s got image, it’s got the looks and there’s no better car in this class when it comes to roughing it. The new Jeep Compass SW Diesel might not be the pinnacle on-road, but it’s a tough cookie that will win lots of fans.